As spring really kicks off now, woodland gardens and all their associated plants really come into their own. Here are just some of my favourite plants for lovely April flowers. This fantastically useful ground cover plant is a real bonus in early spring. 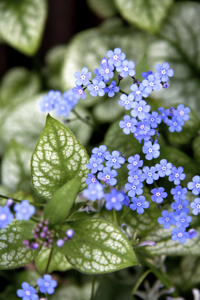 It has pretty blue forget-me-not type flowers and very attractive heart-shaped leaves with beautiful silvery white markings. ‘Jack Frost’ is a star of the shady garden, where it will thrive in the cool, moist air, especially if the soil is fairly rich, although it can tolerate periods of drought. At an approximate height of 40cm and spread of 50cm, it’s good for putting under shrubs where group plantings will soon spread into a carpet of silver. There are many excellent varieties of Brunnera macrophylla – the silver-leaved white-flowering ‘Mr Morse’ for example, or variegated ‘Hadspen Cream’ which has an attractive creamy yellow margin around the edges of the leaves which combine beautifully with its blue flowers. ‘Betty Bowring’ is has lovely white flowers and plain fresh green leaves. Once Brunnera has flowered it should be cut back (both the old flowered stems and the foliage). 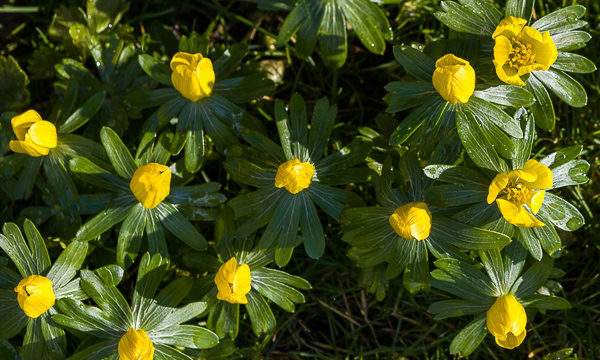 This may seem a little strange, but the plant will soon regenerate and by doing that you’ll be rewarded with a tidy clump of fresh new foliage to see you through the summer. Tiarellas are commonly known as foam flowers due to their frothy blooms. They are related to the popular heucheras and heucherellas, but prefer more shade than their cousins. They also flower a little earlier. Last April on a visit to the Savill Garden, the sight of a carpet of Tiarella cordifolia under a flowering crab apple tree just about took my breath away. It was such a beautiful combination. In large gardens the species can be allowed its head, and will happily cover the ground under trees and shrubs. 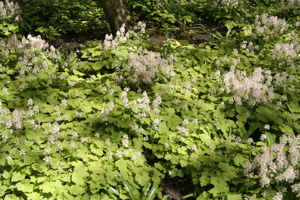 For smaller gardens Tiarella ‘Spring Symphony’ produces a mass of dainty flower spikes containing white stars that open below a tight, apple-blossom-pink poker of buds. The foliage, which is deer and rabbit resistant (allegedly! ), has fingers of vivid green, etched in black along the mid-rib. It spreads, but not invasively. 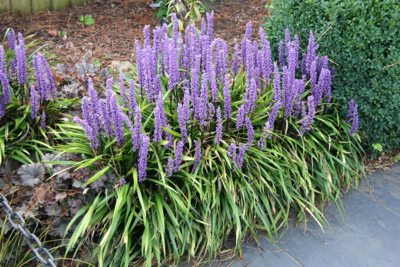 Tiarellas are very useful small plants for shady areas, and are fairly drought tolerant once established. 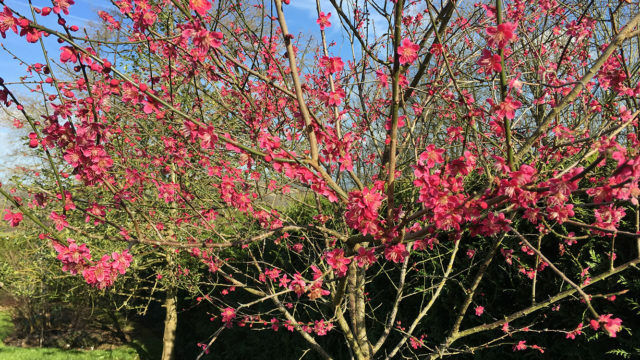 This ornamental cherry shrub is sensational in spring when its profusion of light red buds open to pale pink flowers with red centres. These are followed by attractive dark purple fruits in autumn. Yellow-green foliage follows the flowers in spring, turns mid-green by summer and then a vibrant orange red in autumn. 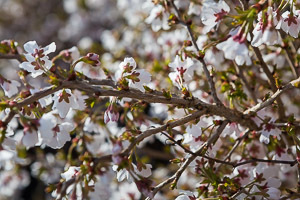 Prunus ‘Kojo-no-mai’ prefers full sun, although it can tolerate some shade, and will grow (slowly) to about 2.5m x 2.5m in any moist but well-drained, reasonable soil. It can be pruned, after flowering, to restrict its size, and is often seen as a bonsai specimen in tiny Japanese gardens. It can also be used as a hedge. This shrub looks wonderful underplanted with Pulmonaria or Tiarella. 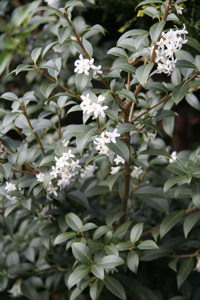 Osmanthus x burkwoodii is a dense, slow-growing, large evergreen shrub that can ultimately reach 4m high and wide, but can be clipped to keep to size. It is invaluable for dry shady areas, and works well as a wall shrub, or trained against a fence. Delightful (but small) highly scented jasmine like white flowers are produced in April and May. The glossy, dark green leaves make a lovely backdrop for other flowering plants and brighter foliage through the summer months. Admittedly not the most exciting of shrubs, it’s one of those easy, tough, unfussy plants for more difficult areas of the garden – and one I’ve come to rely on! This dainty but stunning spring bulb deserves close attention – which may mean getting down on your hands and knees to take a look as it only gets about 10 inches high! It’s worth the effort though. The snake’s head fritillary has a lovely nodding bell-shaped flower, which is covered in a very distinctive checked pattern whether it’s the purple or white form you’re looking at. 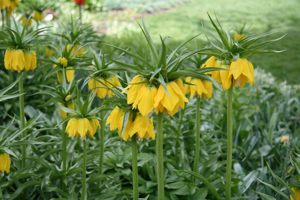 As a total contrast, Fritillaria imperialis ‘Maxima Lutea’ AGM (commonly known as the Crown Imperial fritillary) sends its bright yellow bell-shaped flowers up to 1.5m in height, and tops them off with a tuft of pale green leaves. Very dramatic! Fritillaries prefer fertile but well-drained soil, in full sun or (preferably) partial shade – which makes them ideal plants for borders or naturalised in grass in woodland conditions. Another sure sign that spring is on the way is the sight of the Star Magnolia) flowering in gardens across the land. This is a really popular shrub (or small tree) for small gardens, with its white flowers which smother the plant for weeks. They make a stunning site against the backdrop of a clear blue sky. 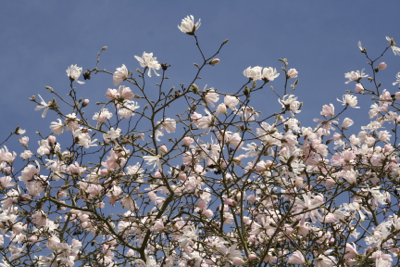 Magnolias prefer a reasonably fertile soil which is neutral to acid in pH. Stellata is an early flowerer which is probably one of the reasons its so popular. It’s best to position it in a sheltered sunny site, as the weather can be so unpredictable here at this time of year, and it would be such a shame to see all those beautiful flowers disappear in a strong gust of wind! Click on the link to read about Rhododendrons & Azaleas which are also coming into flower at this time of year. Beautiful photo’s. The Fritillaria meleagris are my personal favs. I’ve got some growing in a pot and they look really nice. 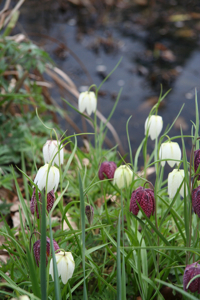 Thanks Sophie, and I quite agree, the snake’s head fritillaries are stunning aren’t they?